This 90 page book, written by Constantine R. Campbell was a light and enjoyable book for anyone who aspires to learn Greek. I think that beginning Greek students, graduates of the Greek language, teachers, and preachers, will find this book edifying and enjoyable. After reading this book, I am going to recommend this to some people in my church who just started learning the Koine Greek. I hope that it will be an invaluable tool for them during their Greek endeavor. “Learning Greek vocabulary, practicing paradigms, and other such things have their place, and I’ll discuss them later in this book. But they are no substitute for reading Greek, and for busy people who can only afford to do one thing related to Greek each day, it must be this. There are several reasons for this. First, reading Greek is our goal. It’s why we’ve learned Greek in the first place: to read and understand the Greek New Testament. There’s nothing like practicing to achieve your goal. Second, reading Greek brings all the other skills into play: vocabulary, grammar, and syntax are all required for reading, and the reading reminds, refreshes, and reinforces all those things. Use Software Tools Wisely: The author does not cast anathemas to individuals who use Bible softwares; nor is he against its use, but he does exhort one to not abuse it. The author does mention that during his doctorate program, the aid of BibleWorks helped him. Without it, he would have taken ten years to finish the program. What the author said above is in accordance with my experience. I found Greek challenging during some of the Greek quizzes, because there were moments where I was not saturated with some of the vocabulary words. Some tips the author provides in order to retain the vocabulary words is to have a memory hook, make the words fun to remember, pronounce each word, listen to the vocabs, write out the vocabs, try translating the vocabs from English to Greek; and make Greek a passionate, long-term pursuit. Unlike the Greek, the English translation of the Bible does not make a difference between the singular “you” and plural “you.” If it fails to make the distinction, just imagine what are some of the implications entails for verb tenses. As a result, practicing your parsing is critical. “You don’t want to end of sort of recognizing verb forms, but not being able to spell out what they are–that’s a sign of unkeeping your Greek! Read Fast: Most people will tell you read slow so that you will be able to comprehend the material better. 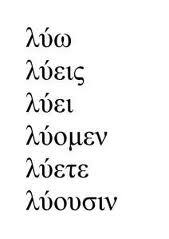 This is not just for Greek, but for all reading in any language. Reading slow is critical as many are aware, but so is reading fast. Try reading this verse quickly: Οὕτως γὰρ ἠγάπησεν ὁ θεὸς τὸν κόσμον, ὥστε τὸν υἱὸν τὸν μονογενῆ ἔδωκεν, ἵνα πᾶς ὁ πιστεύων εἰς αὐτὸν μὴ ἀπόληται ἀλλ᾽ ἔχῃ ζωὴν αἰώνιον. Read Slow: Reading fast is one good strategy, but so is reading slow. According to the author, you will need to mix it up. Summary: Reading Greek slowly will not be easy at first, but overtime, your skills will increase if you practice this method. Use Your Senses: In this chapter, the author mentions that Greek is not a language that you just merely see on a page, but it is a language that requires the use of your senses in the area of speaking and hearing if you want to maximize your learning. Please visit this site if you want to hear the Greek being spoken: http://www.greeklatinaudio.com. Have your Greek Bible with you when doing this exercise. Try singling songs when trying to learn the Greek paradigms. Another good exercise is to reproduce the Greek vocab and paradigms on paper. In this chapter, the author summarizes what was said in the earlier chapters and provides examples of how he implements them in his daily life. I hope this review was somewhat helpful. What I can tell you is that knowing Greek is like watching HD television. Greek will provide you discernment when reading commentaries. You will not be at their mercy. 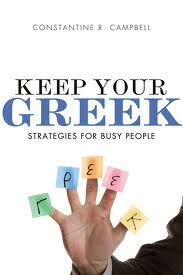 Greek will help you become more astute when you are interacting with journal articles. Moreover, Greek will enhance your preaching and teaching skills, and will strengthen your relationship with the Lord. I hope that is enough to motivate you to pursue Greek.